An authorised 'Moon Mother' is a woman who has taken the certificated Womb Blessing Training workshop with Miranda Gray and is part of the worldwide Womb Blessing family originated by Miranda. A Womb Blessing is a beautiful and powerful way to accept and honour your femininity and to bring transformational healing to your womb and female energies and soul. It releases blocked emotions and patterns and awakens and strengthens the presence of the Divine Feminine. It helps you to accept Love and celebrate and enjoy all the beauty, strength, wisdom and creativity we have as women. A Womb Healing is a gentle supportive way to awaken and revitalise your Womb centre and its female archetypal energies and bring self-empowerment, self-confidence and well-being. It also helps integration of the Womb Blessing energy and experiences. Moon Mothers offer hands-on Womb Blessings and Womb Healings, and can answer questions about the Worldwide Womb Blessing. Book a personal Womb Blessing Attunement and a Womb Healing with a Moon Mother for healing, and for spiritual and personal development. Invite a Moon Mother to your Worldwide Womb Blessing group or ask her to run a group. Having a Moon Mother at your group will enhance the energies received. Ask where Moon Mothers are holding groups. Ask a Moon Mother about Womb Blessing Training workshops in your area and what is involved. Any questions? Ask a Moon Mother! An Advanced Moon Mother is a Level 2 Moon Mother or above who wishes to help women through guiding and mentoring their awakening and the path of authentic femininity. Advanced Moon Mothers are companions on a woman’s cyclic and spiritual path. They do not fix the cycle, tell a woman what to experience, or judge a woman’s life and body choices. They are there to explain the Cyclic Woman concept and to give ideas and suggestions on how a woman can change her life to stop her archetypal energies from becoming depleted or blocked. The purpose of the mentoring is to teach a woman to live her life in confidence and in harmony with her cycle so that she no longer needs a supporting guide. Level 2 Moon Mothers are those who have been taken deeper into their personal spiritual path, expanding their important work as a Moon Mother and guided on a daily Moon Mother path. Level 2 Moon Mothers can give higher-vibration Level 2 Womb Blessings and Level 2 Womb Healings, as well as 'The Gift' for men. They use the beautiful Moon Mother energy symbol which holds the vibration of the four female archetypes. 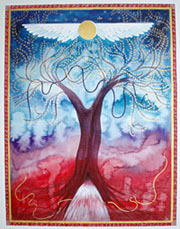 Level 3 Moon Mothers are those who have been taken even deeper into their personal spiritual path. Level 3 Moon Mothers learn a range of Level 3 Womb Blessings and Womb Healings using the MotherSoul energy, Moon Mother symbols and MotherSoul symbol. Moon Mothers puede proporcionar Womb Blessings y Womb Healings, y puede responder preguntas acerca de la Bendición Utero en todo el mundo. Concierta una Sintonización para una Bendición de Útero personalizada y/o una Sanación de Útero con una Moon Mother para tu sanación y tu desarrollo espiritual y personal. Invita a una Moon Mother a tu grupo de la Bendición del Útero Mundial o pídele que organice un grupo. Tener una Moon Mother en tu grupo incrementará las energías recibidas. Pregunta a las Moon Mothers dónde se reunirán los grupso. Pregunta a una Moon Mother sobre los talleres del Entrenamiento de la Bendición del Útero en tu zona y lo que eso implica. ¿Tienes más dudas? ¡Pregunta a una Moon Mother! Moon Mothers nabízí hands-na děloze Blessings a děloha uzdravení, a může odpovědět na otázky týkající se celosvětového dělohy požehnání při.